The latest Color Confidence Digital Imaging Workshop has helped to educate, both amateur and professional photographers, on the importance of the colour workflow process from camera through to print. Event feedback forms collected at last week’s Digital Imaging Workshop found that many people were keen for Color Confidence to continue to host colour management events in the UK, with 41% of delegates travelling over 50 miles to attend the event. Color Confidence, Europe’s leading supplier to the photography market, held the Digital Imaging Workshop at The Rep in Birmingham last week Wednesday. The day was split into a morning of seminars and an afternoon of interactive activities, with guests having the option to attend just the morning session or stay for the full day event. In total 92% of attendees stayed for the full event, with 33% requesting to see colour management tutorials. The morning consisted of four seminars with guest speakers from Adobe, Macphun Software, DxO and a session with Fashion and Beauty Photographer Andy Kruzcek. In the afternoon guests were given the option to choose two of the following three activities, a photowalk with professional photographer Andy Kruzcek, an Adobe workflow seminar with David Mallows, or a specialist 1-2-1 training session with their chosen vendor. There was a trade and exhibition area open throughout the day with technical specialists from some of the world’s leading manufacturers including NEC, X-Rite, DxO, EIZO, Macphun Software, Epson, Manfrotto and Tecco. Color Confidence offer a range of professional training courses and consultancy services with packages to suit users of all levels, from individual photographers and imaging professionals, to large-scale publishing houses and multinational companies. There were a total of 50 attendees at the Digital Imaging Workshop. All attendees were entered into a prize draw to win a brand new NEC monitor. The winner was announced on the day. We were please to announce Philip Higgins as the prize draw winner of a brand new NEC monitor. This entry was posted in Color Confidence, Color Confidence Range, Colour Management, Colour Reference, Competition, Consultancy, General News, Monitors, Photography, Profiling on November 24, 2014 by Color Confidence. Win A Colour Workflow Bundle! This month, we are giving you the chance to win a huge bundle of prizes, including an NEC E223 monitor, Macphun Creative Kit software and an i1Display Pro, plus lots more! 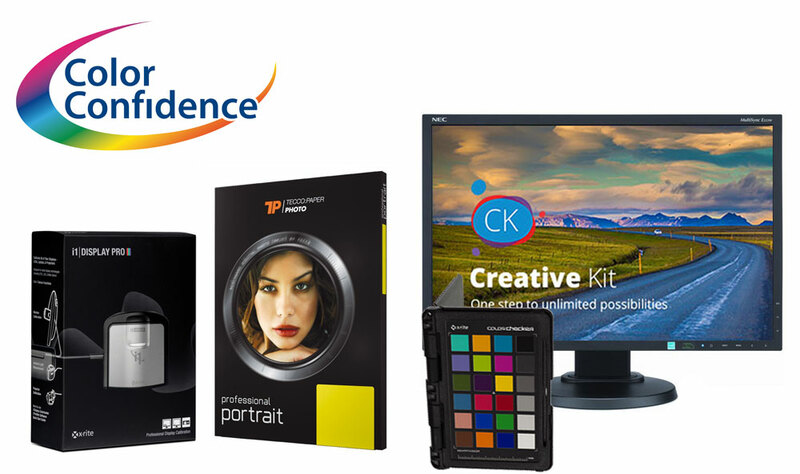 This prize bundle, worth almost £700, is designed to help you manage and improve your colour workflow from capture, to edit, to print. ColorChecker Passport – Ensures the images you capture are accurate in colour. Tecco Paper – 2 boxes of A3 Sepia Satin Portrait paper for outstanding prints. To be in with a chance of winning this brilliant colour workflow bundle, all you have to do is show us your best images of ‘Colour’. These could be abstract close-ups, images featuring a strong, vibrant colour, animals with pretty colourings, or a beautiful natural occurrence, such as a sunrise or sunset. We want to see how you can incorporate colour in different ways into your images. Get creative and show us your best ‘Colour’ themed images! The competition closes at midnight on 30 November 2014. For more information and to enter now, take a look at the Competition page. This entry was posted in Calibration, Color Confidence, Color Confidence Range, Colour Management, Colour Reference, Competition, General News, Monitor Calibration, Monitors, Photography, Printing, Profiling on November 1, 2014 by Color Confidence. To all our creative Color Confidence followers! Introducing a brand new up to date version of the Pantone Capsure and FHI Color Guide bundle. 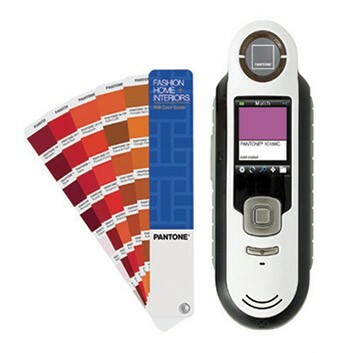 Treat yourself, your office and your clients to a Pantone Capsure and FHI Color Guide for the chance to accurately measure colours wherever you are, and refer back to all the Fashion and Home set of Pantone colours. This post will explain all the features of the Pantone Capsure and FHI guide and explain how beneficial this bundle can be for you. The Pantone Capsure allows you to confidently and accurately capture colour from any surface and match it to the closest official Pantone colour. The Capsure is loaded with over 8,000 colours from 8 different colour guides and the colours you capture can be directly matched to any of these guides for prime accuracy. The Capsure is ideal for fashion, interiors and all creative industries, allowing creatives to use the Capsure portably to match any surface to a Pantone colour, create colour palettes or descriptive mood boards for any project. The screen on the Capsure is 1.75 inch and has a variety of settings, along with providing the page number, sRGB and HTML values, and mixing recipes for the fan guides you choose to correspond the colour you’re matching to. The Capsure uses camera technology to pick up not only spot colours, but also patterns and textures and often provide you with two Pantone matches from one colour swatch. 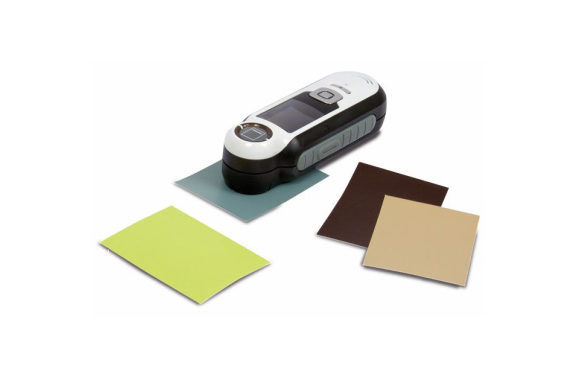 The Pantone Capsure comes with Color Manager software. This allows you to import your colours to the software and create colour ways and palettes. Palettes can be fully integrated and exported quickly and efficiently to Photoshop, Illustrator etc. 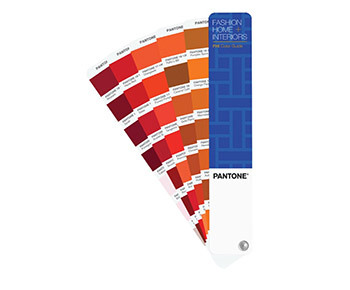 The new Pantone FHI Guide gives you 2,100 fashion and home colours on paper in compact and highly portable fan deck. This resource inspires easy colour selection and specification and allows you to communicate your colour choices and ideas with anyone, anywhere. Each colour swatch has a name and numerical reference. This identification allows for quick decisions and easy referencing which makes it the ideal tool for activities such as client meetings, on site reviews and sample shopping. When using the FHI colour guide, you will have accurate and consistent colour selection on the move. Purchasing the Pantone Capsure & FHI Guide will give you the best opportunity to capture your colour and instantly reference it to your fashion and home guide, giving yourself, your customer and your office the best chance for accurate colour management and specification on any project you are working on. Color Confidence presents this new product bundle to our followers at a brand new, lower than ever price of £499.00! This entry was posted in Color Confidence, Color Confidence Range, Colour Management, Pantone, Profiling on February 18, 2014 by colorconfidence. It’s always good getting out and about and talking to people face to face. It’s something we enjoy, and without wanting to boast, it’s something we’re very good at. We had a great time talking to you all, and we hope you enjoyed our seminar session in the evening. “My images look great on screen, but don’t look anything like it when printing out” – or in other words; how can I get my printouts to match my screen? The answer is calibration – a calibration of both a monitor and printer to be precise. The device capable of performing both is called the ColorMunki Photo from X-Rite. Whereas other calibrators will just take care of your screen or projector, the ColorMunki Photo will do your screen as well as any printer(s) you have connected to your laptop, Mac or PC. Essentially it does the same thing to both devices; namely getting them to display or printout a series of colours for it to measure, compare to what the colour should be and create a profile to compensate for the difference. Once these profiles are saved and applied to your machine you can start printing with peace of mind what you see on screen is what you’ll see coming out of the printer. Calibrate your screen once a month and profile your printer for any paper/ink combinations and you’re good to go. You can learn more about ColorMunki Photo here. This entry was posted in Color Confidence, Colour Management, Photography, Printing, Profiling and tagged Calibration, Color Confidence, ColorMunki Photo, Colour Management, Monitor Profiling, Printer Profiling, X-Rite on April 19, 2013 by colorconfidence. Why don’t my printouts match my screen? Whether on the phone, at Focus on Imaging, or at one of our Drop-in days; “why does my printout look different to what I see on-screen” is a frequent query from photographers and designers alike, particularly those that are starting, or wanting to print from home. Luckily, there is a simple solution to this problem in the shape of the X-Rite ColorMunki Photo. ColorMunki Photo has been designed to be an all-in-one spectral device for monitor, printer and even projector profiling – basically, a device that will ensure what you see on your screen is replicated as closely as possible when you print out. It does this by calibrating/profiling both your LCD/CRT monitor and your printer. Firstly, working like a ‘conventional’ monitor calibrator, ColorMunki Photo will create a custom profile you can save and apply to your monitor. It will integrate your display contrast settings and brightness into your workflow, giving you accurate on-screen colours. Secondly, ColorMunki Photo will calibrate your RGB or CMYK printer by getting it to print out a series of test charts. 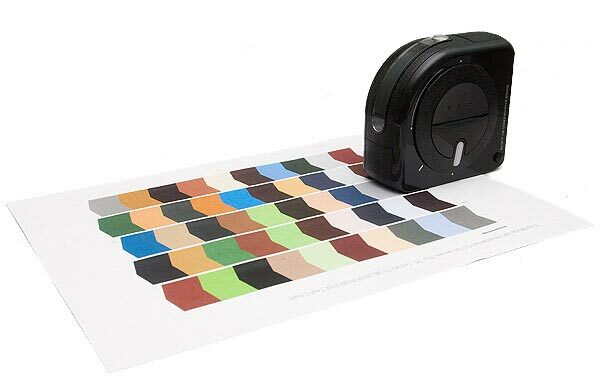 The ColorMunki will scan the first test chart, learning how your printer behaves with these colours. Once this is done, a second chart is produced and scanned by the ColorMunki, thus creating a printer profile to save to your printer. Colour accuracy is now achieved across your workflow from monitor to printer. Learn more about ColorMunki Photo and how it can benefit your workflow here. This entry was posted in Calibration, Colour Management, Monitor Calibration, Printing, Profiling, X-Rite and tagged Color Confidence, ColorMunki Photo, Colour Management, Monitor Calibration, Monitor Profiling, Photography, Printer Profiling, Printing, why don't my prints match my screen, X-Rite on September 21, 2012 by colorconfidence. A name which lends itself to a host of puns and cheesy marketing gimmicks – although to be fair, I think we were fairly restrained with our efforts at CC HQ! If you are completely new to the world of colour management, image editing or photography and are starting to require a solution to produce greater on-screen accuracy, then this is the solution for you. Have you ever wondered why the pictures you took on your camera don’t look the same when displayed on your monitor? Well, monitors aren’t prefect; displayed colour can vary from monitor to monitor or even drift over time. This means the image you view on screen might not be a true reflection of what you actually captured. Monitor calibrators are designed to solve this problem by optimising your monitor to display colours as accurately as possible. The ColorMunki Smile has been designed with simplicity in mind. Unlike its bigger brothers; ColorMunki Display and i1Display Pro which offer a host of advanced features to play with, the Smile is as straight-forwards as plugging into your USB and letting it get on with calibrating your screen. This means you don’t need to have an expert knowledge of colour science to get the results you want. In a nutshell – this is the ideal monitor calibrator for a beginner. 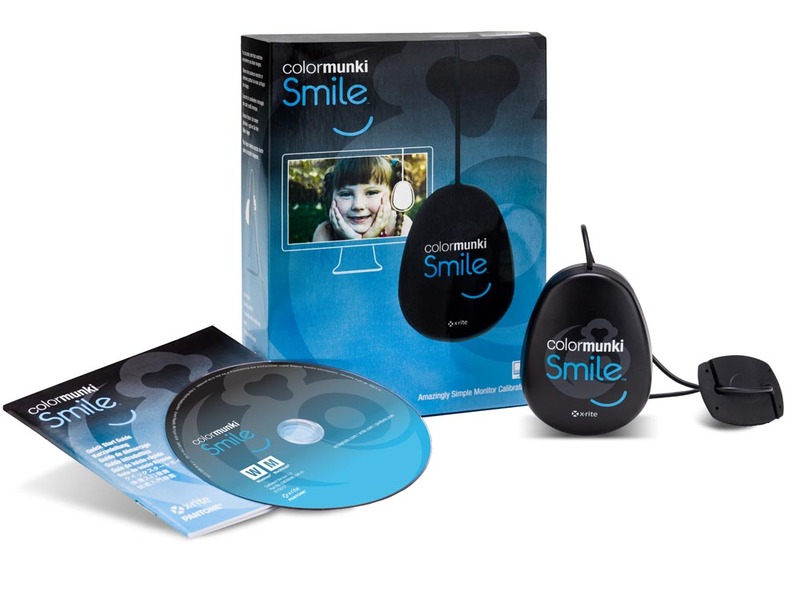 You can learn more about and purchase ColorMunki Smile here. This entry was posted in Calibration, Color Confidence Range, Colour Management, Monitor Calibration, Profiling, X-Rite and tagged Accurate Images, Color Confidence, ColorMunki, ColorMunki Display, ColorMunki Smile, Colour Management, i1Display Pro, Image Editing, Monitor Calibration, Monitor Display, Monitor Profiling, Photography, X-Rite, X-Rite colormunki smile, X-Rite Smile on September 18, 2012 by colorconfidence. In a slight change of plan to the one described in our previous Nik blog post, this week we’ll be looking at how to create outstanding black and white images using Nik Silver Efex Pro 2. 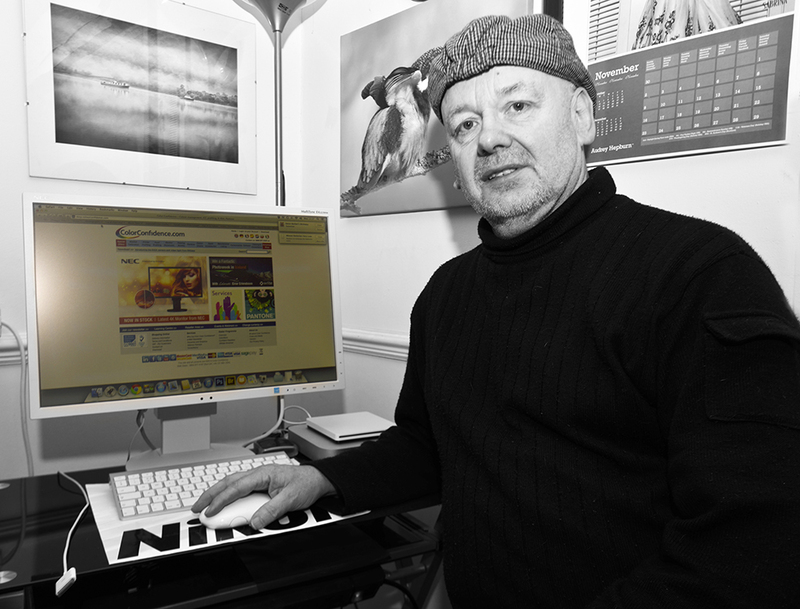 In a nutshell, Silver Efex Pro 2 allows you to turn any digital image (colour or otherwise) into black and white one. Inspired by the darkroom, Silver Efex Pro 2 is arguably Nik’s flagship product. Whenever we’re at a trade show it’s more often than not one of our most recognisable and liked products on show. Indeed, many of our staff here with a keen interest and experience in photography express how good and powerful Silver Efex Pro 2 is. EISA agreed too; awarding it ‘Best Product’ in their photo software category 2011-12. So what makes Silver Efex Pro 2 so complete? Black and white effects can create a timeless, classic feel to images. Silver Efex Po 2 quickly and effortlessly transforms digital colour photographs into artistic, sophisticated black and white images. By taking advantage of intelligent tools and presets, and Nik’s U Point Technology, you can open up a range of precise, creative and experimental options for black and white images. ‘Dynamic Brightness’ ensures that different areas of your image receive different brightening adjustments based on the tonal values of that area. This means that darker areas within an image can get brighter without affecting the lighter areas of the image and visa-versa. Traditionally this process would take time to do in Photoshop, but Silver Efex Pro 2 does this in minutes. ‘Structure and Fine Structure’ adjustments enhance light and dark uniformity throughout an image using Structure Control. This works by working precisely ‘between’ edges and defined lines within an image, consequently bringing out textures and details. Crucially, it does this without creating an over-sharpened look, which can cause an un-natural or over-saturated looking image. A ‘Grain Engine’ feature helps you set the mood of an image. Using powerful algorithms, Silver Efex Pro 2 allows you to layer grain on an image using grain settings pre-defined by you. This results in a more ‘natural’ looking, nostalgic image. These are just a few of the features contained within Silver Efex Pro 2, there are many others that make it a supremely powerful tool for editing images. For a complete feature run-down, the Nik Software webpage details exactly what you get in the software. There’s also further descriptions here. In two weeks time we’ll continue our bi-weekly feature on Nik Software, taking a closer look at the Nik plug-in range as a whole, and more importantly, why you need them. This entry was posted in Photography, Profiling and tagged Black and White, Image Editing, Nik Software, Photography, Silver Efex Pro 2 on February 3, 2012 by colorconfidence. Your box contains the ColorMunki software on disc and the first step is to load that onto your machine, by following the simple on-screen prompts or video tutorials if you need them. If you use a Windows operating system, the Hardware Wizard will automatically launch and install the drivers for the device. Now launch the ColorMunki software. Before you begin the process of calibrating your monitor display or projector, you can set and personalise your software preferences, to ensure that you deliver the results for your project and viewing needs. One of the advantages of ColorMunki Display is that you can calibrate both monitor displays and projectors. For the purposes of this overview, we will walk through how to calibrate a monitor display. Select ‘Profile My Display’ from the menu of options on the right-hand side of the on-screen interface. Set the ‘White Luminance’ to automatically match ambient lighting or to a value that suits your personal environment. A darkened room is ideal and for optimum results you can also ask the software to monitor the effects of ambient lighting for you. Flare Correct – compensates for any light or glare that falls directly onto your screen, it is a good feature to use in conjunction with adding a monitor hood in creating the most accurate working conditions. You are now essentially done! Name your profile as you wish and click ‘Save’ – you can also ask the software to diarise a re-calibration date, and we would suggest that you do this for a reminder every calendar month to sustain your colour accuracy and consistency. A Before & After comparison allows you to view the effects of the calibration process that you have just undertaken. A range of default images can be accessed to prove the effects of the profiling or you can load your own comparison images by accessing the ’Image’ drop-down menu. The final step is to enable ‘Ambinet Light Monitoring’ – but only do this if you elected to use the ambient light features when you created the profile. The benefit of enabling this feature is that automatic adjustments will be made based on how ambient light changes throughout the day within your working environment. You can also ask the software to flag any recommended adjustments so that you can apply manually if you prefer. This entry was posted in Calibration, Monitor Calibration, Profiling, Training, X-Rite and tagged ColorMunki Display, Help, Training, X-Rite on July 13, 2011 by colorconfidence. This latest segment of colour confidence blog posts will link to information from our Learning Centre, and hopefully give you an insight into a range of topics you may find a bit puzzling! First stop is colour management itself; what is it exactly, and why do you need it? monitors of the same model and type will display slightly different results. “To keep your colour consistent from device to device, you need colour management. At the heart of colour management is the process of profiling (also known as ICC profiling). By profiling a device, you can ensure it is displaying colour correctly within its capabilities, based on industry standards. Once the profiles are in place, you can make sure colour is reproduced in the same way by all devices – to put it simply, you can get your printer to create a print that looks as close as possible to the picture on your monitor. So, colour management is the process to help you keep colour accurate and consistent throughout your workflow. But what ways are there to introduce or commence the colour management process? All three have their own solutions, and all three have their own processes to help you achieve accurate colour. Crucially though; when these methods are combined – you start getting incredible results. Want to know more about the why and the how to start profiling – download our colour management pdf which explains the processes a little further. You can then check back to colorconfidence.com to see which solutions might be best for you. This entry was posted in Color Confidence, Colour Management, Profiling, Training and tagged Camera Profiling, Color Confidence, Monitor Profiling, Printer Profiling, Training on May 27, 2011 by colorconfidence. Profiling a printer is a requirement if you want to get correct colour prints. Just like a picture looks different depending on the type of light you look at it under (or under no light and you can’t see the picture), the ink in your printer will produce different results depending on the type of paper you use. Even if you use paper supplied by the printer manufacturer and select their recommended print settings – although you should get ‘reasonable’ results – it will not be perfect. Each printer off the production line will vary slightly, and different room conditions (temperature and humidity) will affect how the printer ink and paper react – resulting in colour variations. A printer also changes with time – not just winter to summer depending on the conditions, but through wear and tear and variations in the consumables. So the way to control all this is by making profiles for your printer – one for each paper type and with a reasonably stable printer, they should be remade every 1-2 months – or more frequently if there is a noticeable change which could be caused by one of many factors. There are two entry-level instruments available; the Color Munki (from X-Rite/Pantone) and the Spyder Print (from Data Colour). Moving up a level, there is the i1 Pro instrument (from X-Rite). The Color Munki instruments will let you calibrate printers as well as monitors. They come with software for doing all sorts of other things with colour also, so it is a product that you could end up benefiting from using more frequently than just once a month for calibration. If you are printing your own pictures, it’s worthwhile considering a Color Munki to calibrate both your monitor and printer. Otherwise with just a monitor calibrator I expect it will be frustrating knowing that your pictures will look correct on-screen but you are having to make them look wrong and waste time, ink and paper on getting a print to look like you originally had on your correct monitor. 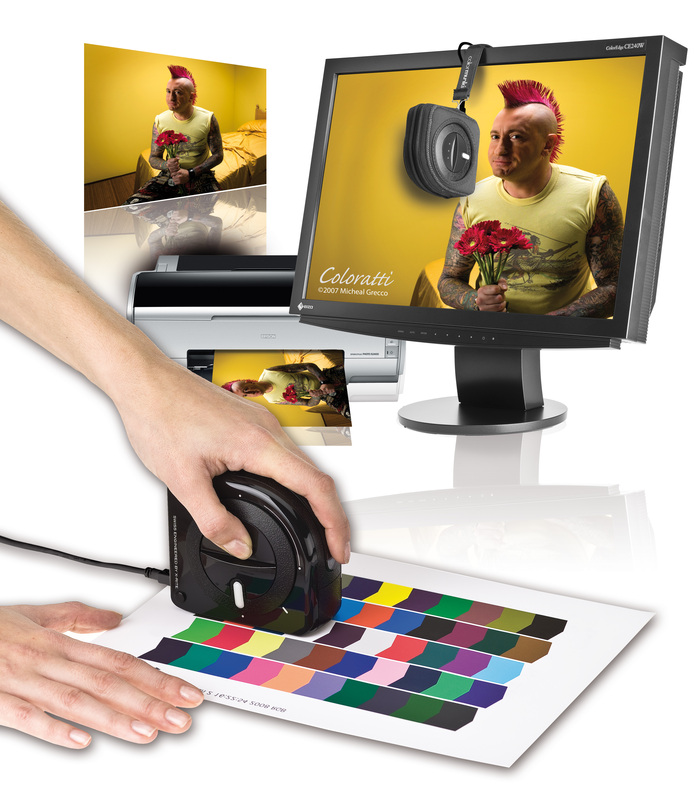 With both your monitor and printer calibrated, you will know images on your screen are colour correct. Furthermore, when you go to print, you can select the profile you made for the chosen paper type and the computer will adjust the image data within the printing process configuring the printer/paper profile to produce a colour correct image in print. If you have any other questions about printer profiling, get in touch or comment below and we’ll answer them. This entry was posted in Color Confidence, Printing, Profiling and tagged Color Confidence, Color Munki, i1 Pro, Printer Profiling, Spyder, X-Rite on December 17, 2010 by colorconfidence.